The truth is, I love racing. I feed off of competition. The reasons I do not race every weekend have more to do with the weight of my wallet than the benefits of focusing on an “A” race. But over the last week and three days I had the unique (at least for me) opportunity of running in three different races in ten days. It was a lot of fun tackling some different distances and although I didn’t tackle all of my goals, I did get a couple of wins and a renewed confidence heading into the new year. 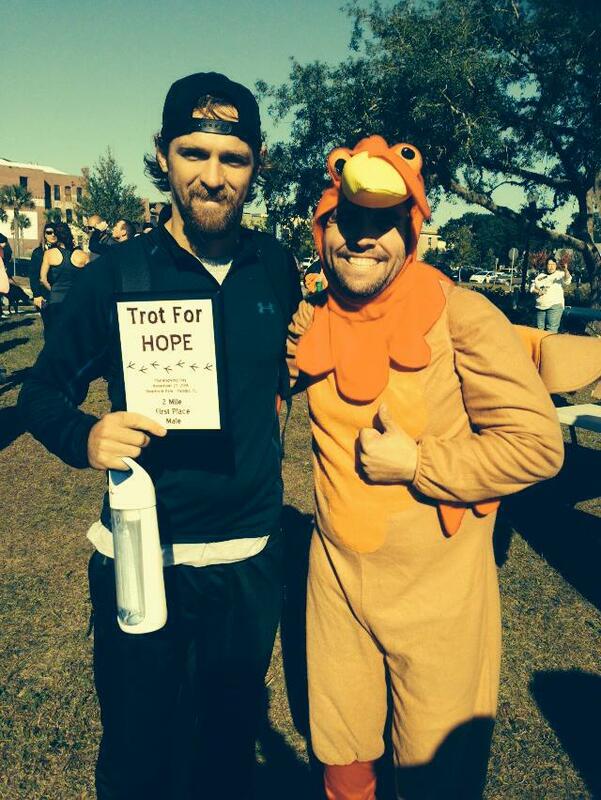 The first race in my personal race series was the Trot for Hope 2 mile in Palatka Florida. Palatka is a little town about 20 miles from where my family lives in north central Florida. This was the first time I have run in front of my dad since college track and the first time ever my aunt and cousin, two of my biggest supporters, have seen me run ever. To say I was hyped would be an understatement. I had a time goal in mind but my real goal was to try to win the race outright. I was worried it would be cold but the temperature turned out to be a perfect 60 degrees. I lead the race from start to finish! I wanted to start off fast because I was worried that some high school runners would be there and I wanted to try to intimidate them from the start. After I passed the first mile marker a police officer informed me that I was ahead by about “three blocks” and I started to let off the gas and enjoy the nice small town of Palatka. I crossed the finish line pumping my fist in a time of 10:54 and first place overall. Not near the goal time I had in mind but winning in front of my family was enough satisfaction for me. I did get to meet a local ultra runner, he came in right behind me in the race. He was awesome and allowed me to join him for a run on Saturday. The race was well-organized and the course was clearly marked! This race might be on my list for as long as they hold it! The second race in the series was the Boca Holiday mile. This race was held on Wednesday, minutes before the Boca Raton Holiday parade. This was about as anxious as I have ever been for a race that I wasn’t actually training for. I hadn’t broken five minutes in the mile since college, and it was a bar I had I set for myself since I returned to running 3 years ago. I forgot how much I love the mile. It had been my favorite event since I first ran it in a track meet back in the eighth grade. Your legs hurt, your lungs burn, and before you know it you are face down at the finish line and it is all over. (Okay maybe that last one is just me.) I really wanted to break that elusive five-minute mark. I had a clear strategy heading in to the race; run as hard as I could for the entire mile and be satisfied with whatever happened. After the gun went off I was in a totally different world. I was running through a crowd of screaming people and I could barely hear a sound. As we made it to the grandstand set up for parade viewing around the half way point everything was on fire. In the third quarter of the race I felt myself fading off the leaders because of my aggressive start. Then I had the finish line in sight and everything faded into a haze. All I could make out was the bright red numbers clicking off the clock to my left. 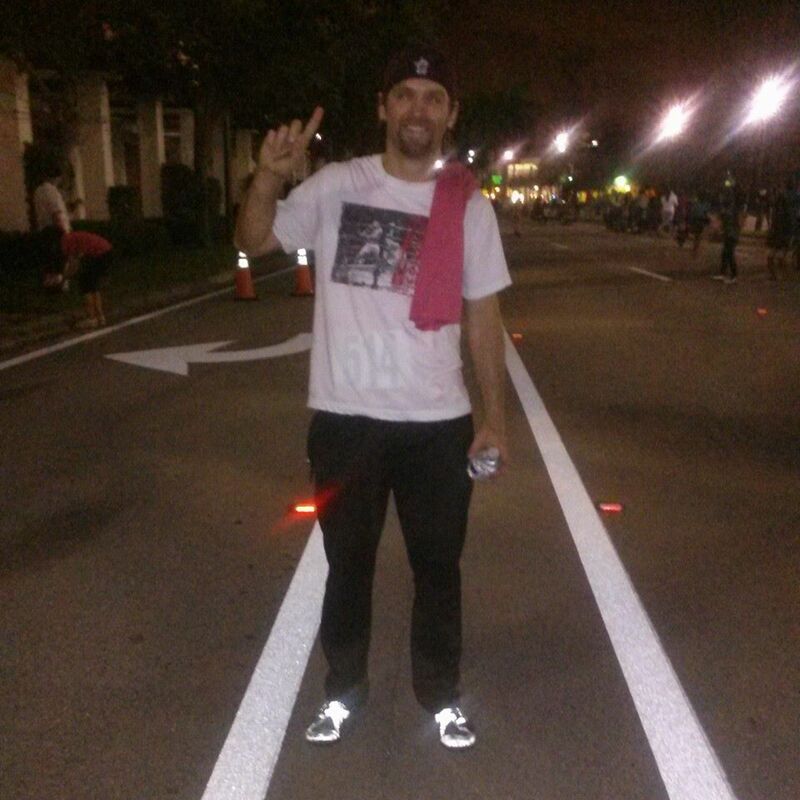 As I passed through the finish line the fatigue overwhelmed me and I fell on my face next to a guy throwing up on one of the busiest streets in Palm Beach County. I knew I had broken five minutes. As I passed the clock it was clicking off 4:56. My official time was 4:58, I had officially rejoined the sub-5 club. This race was a little helter-skelter, they kept pushing the start time back to make sure the streets were clear. I was fully warmed-up and then the organizers announced that the race was moved back ten minutes. The experience of running down a blocked off street with thousands of people screaming for you was amazing and I am so glad I was able to take part! 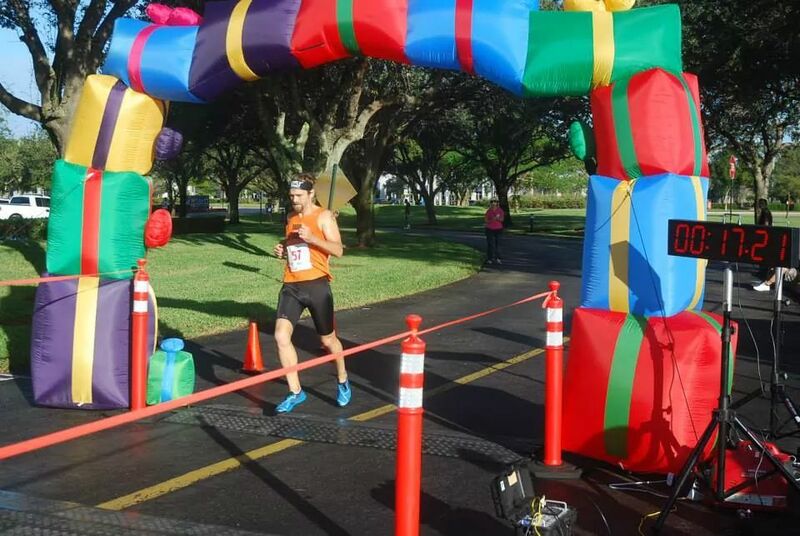 The last race in my personal quest was the Jingle Jog 5k put on by the Greater Fort Lauderdale Road Runner’s Club. I was at this race last year helping out and really wanted to give it a go. We made it a family affair as my wife ran the race with me and my daughter toughed out the kids mile. I really wanted to try to go under seventeen minutes for the race. I felt great going in and knew the competition would be stiff, but the heat seemed to take a toll on all of the runners. From the gun there was a pack of three of us leading the race. It was a pretty eclectic group out front with a sophomore in high school leading the way, a guy in his thirties (that’s me), and a gentleman in his fifties. It was a pretty close race for the first mile and a half. I decided to try to open the race up a bit because I knew I wouldn’t have the speed to out kick a fourteen year old kid with a strong running resumé. I was actually quite surprised that none of them matched my move so I decided to continue pushing to make sure and leave no room for error. With about a half mile left I really opened it up. I had no watch on and the only mile with a time was the first one, so I wasn’t sure if I was on track to break seventeen. I just pushed as hard as I could and crossed the finish line with my second first place overall finish in 10 days. Even when you miss out on your time goals there are very few things that feel better than an overall win! Even with Boston Marathon training looming in the new year, down time in training is still very monotonous. I love the everyday grind of training, it makes me feel alive, but I also love mixing it up. In the last ten days I was blessed with some awesome reminders of why I put in the countless hours by myself. I am so thankful for my awesome family, especially my beautiful wife and daughter, who continue to be my inspiration even when the miles seem to drag on forever. I do every thing I do for the glory and honor of my Lord and savior Jesus Christ. Without him nothing is possible. I want to take a special moment to thank my coach Kyle. We got together early this year and this has been the best year of running I have had since returning to running 2011, he is a large part of my success. As a coach I think that I have the insight to understand the value of a great one, and I have a great one! How has your winter racing season gone? Are you ready to head into the new year and new challenges? I selected a race shortly after Boston, so I’ll do marathon training right along your Boston schedule, but will just extend my build a couple weeks after you start your taper. That is awesome! Virtual training buddies!!!! Yeah I figured I have 4 guys all about the same level as each other and me, training for the same race and doing basically the same types of workouts for similar goals. Might as well add myself into the mix as well!